Back in February, the Trump administration deported Roberto Beristain, an Indiana restaurateur who owns a popular steakhouse called Eddie’s Steak Shed and is married with three kids. 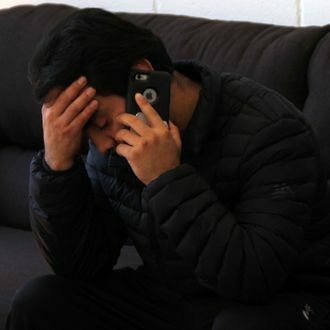 He entered the U.S. illegally in 1997, but beyond that didn’t have “so much as a parking ticket on his record.” And in 2012, the Department of Homeland Security gave him all the documents he needed to stay, as long as he kept out of trouble. On February 6 — three weeks into Trump’s term, a month after officially acquiring Eddie’s, but most importantly, three months after Roberto’s wife, Helen, voted for Donald Trump — the Beristains drove to Indianapolis for his annual check-in with ICE. “I waited in the car, and Roberto just never came back out,” Helen recalls. As Anderson Cooper observed last night on a new 60 Minutes about their predicament, “The irony of what’s happened is not lost on Roberto’s wife.” He sat down for Helen’s first big interview since immigration agents sent Roberto back to Mexico — where, for now, it sounds like he’s moved back in with his parents. COOPER: You voted for him. COOPER: Roberto actually raised that idea? Cooper asked Helen, who is herself a naturalized citizen from Greece, if she regrets her vote, and she told him she’d definitely take a mulligan if she could. “Like they say, you should read the fine print first before you make a selection, I should have listened closely to those debates,” she said. “That was the mistake I made. I didn’t listen.” She recently told The Wall Street Journal that their kids are now being taunted by classmates at school, and the restaurant’s business is struggling without Roberto running the kitchen.